(CBS News) Scientists may be one step closer to identifying what causes rosacea thanks to research that pinpoints bacteria in skin mites as the culprit. 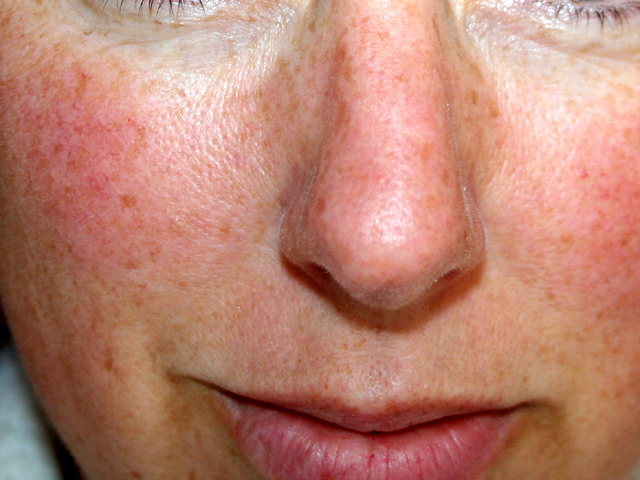 Rosacea is a skin condition that causes people to look like they have red, acne-like marks on their face, according to the National Rosacea Society. It affects more than 16 million Americans, many of whom don't realize they have the disease. Although it is not life threatening, more than 76 percent of patients said in a survey conducted by the National Rosacea Society that they felt having the disease lowered their self-confidence and self-esteem, and 41 percent said it made them avoid public contact or engagements. There currently is no cure, but antibiotics can be used to treat flare-ups. The cause is still unknown. But, a new review published on Aug. 29 in the Journal of Medical Microbiology claims that Demodex folliculorum mites - a type of skin mite - might have something to do with it, in particular the bacteria called Bacillus oleronius that lives inside them. Twenty to 80 percent of people have the skin mites, which are usually harmless and not visible to the naked eye. They typically live in the areas around hair follicles. Patients with rosacea have ten times more skin mites living on them than people who don't have the disease. The Bacillus oleronius bacteria was found in the digestive system of mites living on people with rosacea. Previously, doctors thought the antibiotics that are used to treat rosacea were treating inflammations, but the study shows they may in fact be killing the bacteria inside the skin mites. This means that the bacteria may be causing an immune system reaction, which in turn is causing the redness in the skin. The researchers hypothesize that the mites are releasing the bacteria when they die. "You can think of them like a bus," researcher Kevin Kavanagh, PhD, a biologist at the National University of Ireland, Maynooth in Kildare, Ireland, told WebMD. "They bus in large numbers of bacteria. But it's not the bus that's the problem; it's the bacteria that get off the bus that's the problem." Another type of bacteria, Staphylococcus epidermidis, was only found in rosacea patient pustules but nowhere else on the skin, leading researchers to believe it may be a bacterial problem. "This research is provocative in that it is proposing a cause for rosacea which up to this point has been unknown," Dr. Chris Adigun, an instructor in the department of dermatology at NYU Langone Medical Center, in New York City, told HealthDay. He is wary that the skin mites are the problem, however, since so many people who don't have rosacea have them on their person and other treatments that are known to work do not interfere with the concentration or life cycle of mites. But, if the skin mites are the problem, it may help bring a cure for those suffering from the disease. "[If] these mites exacerbate or harbor bacteria, that could change the therapies that are used to treat rosacea," Dr. Michele Green, a dermatologist with Lenox Hill Hospital in New York City, said to HealthDay. "This could revolutionize treatment."